Ce sac à dos es à la fois tendance et très pratique. Il dispose de 2 anses en coton. Il sera le parfait ami pour transporter vos partitions, accessoires, ou pourquoi pas, tout votre shopping. The backpack music is absolutely fashionable and also extremely practical. The bag is easily and quickly transported by its two handles in cotton. 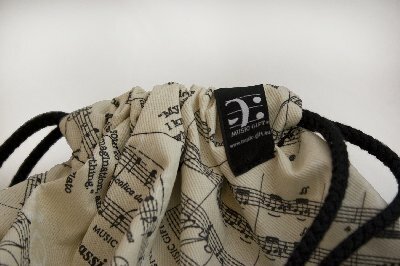 The cool companion to transport your books and other stuffs to the music school, shopping or as a gymsack.